The $750,000 project will develop a new approach to supply chain digitalisation that avoids the use of expensive, proprietary software. The reliance on this type of prohibitive software is one of the major barriers to Australian SME manufacturers participating in global supply chains. BAE Systems will work with existing Joint Strike Fighter supply chain partners Axiom Precision Manufacturing (specialists in the design and manufacture of high quality precision machined components) and RUAG (experts in precision manufacturing, maintenance and engineering). 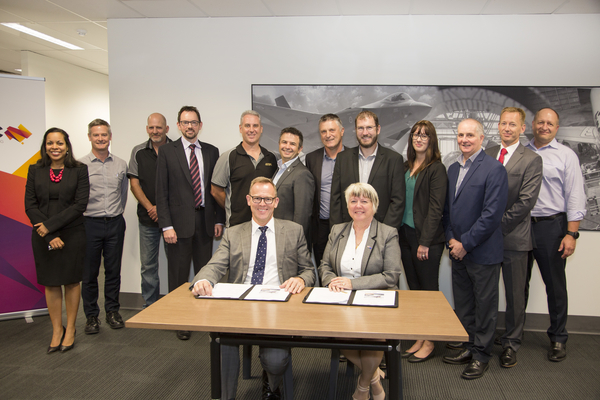 Plus, advanced manufacturing experts Advanced Focus, as well as Flinders University in Adelaide, will lend their extensive expertise to this collaborative project. This project is part of a series of BAE Systems’ broader Industry 4.0 adoption activities and ongoing investments in innovation and technology. In 2017 BAE Systems investment in innovation and technology totalled $17 million, equating to 10% of the company’s Gross Domestic Product contribution in Australia. Successful deployment will see BAE Systems adopt the approach across its various defence projects, including the Jindalee Operational Radar Network and the Hunter Class Frigate Program. Collaborative projects, such as this, deliver better commercial outcomes, increase Australia’s participation in global supply chains, promote the development of advanced skills, and foster best practice and knowledge sharing throughout Australia’s manufacturing industry. The Australian F-35A Project, also known as the Joint Strike Fighter, will see the introduction of a fifth-generation air combat capability to meet Australia’s air combat needs beyond 2030. In addition to the acquisition of 72 new aircraft, the Project will also deliver facilities, weapons and new support systems to meet fifth-generation requirements. The workforce will also need to transition to meet new approaches to operating and sustaining a fifth-generation F-35A fleet. Over 50 Australian companies have directly shared in more than AU$1.3 billion in Project production contracts to date; with hundreds more Australian companies indirectly benefiting through supply chain work. The Project is currently on track to meet initial operating capability in December 2020.